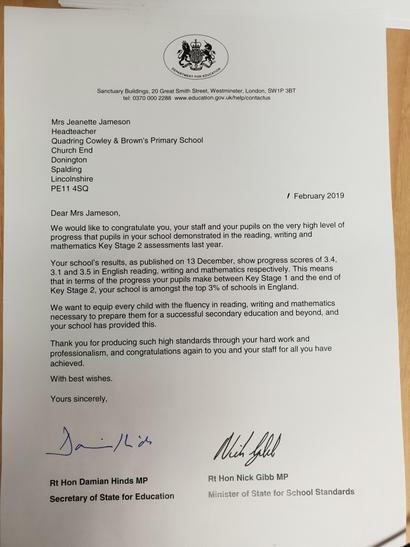 Last week, it was once again a pleasure for the staff and children to receive a letter from the RT Hon Damian Hinds MP, Secretary of State for Education and the RT Hon Nick Gibb MP, Minister of State for School Standards, congratulating the school on ‘very high level of progress that pupils in the school demonstrated in the reading, writing and mathematics Key Stage 2 assessments’. The progress scores gained have placed Quadring Primary School ‘in the top 3% of schools in England’. The letter continued with ‘We want to equip every child with the fluency in reading, writing and mathematics necessary to prepare them for a successful secondary education and beyond, and your school has provided this. Thank you for producing such high standards through your hard work and professionalism, and congratulations again for all you have achieved’. Once again well done to all who made this possible.